You must learn to leave yesterday behind you. The peaks, the valleys, the pain and even the praise. As the day ends you must let your shadows stay in darkness. 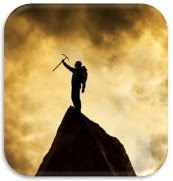 As you climb the mountain seek grace and humility for they are the most powerful forces ever known. Grace wins over the hearts of people, even the difficult ones, and once you have their hearts, their minds will follow. Humility leads by example, which is more inspiring than anything you can ever say. Certainly you will encounter fear but don’t entertain such a thing. Fear comes to torment your soul but it has absolutely no power. Like a spirit that drifts from here to there, let it pass by you with no notice. Only entertain thoughts of goodness and they alone can keep you from losing your balance on even the sharpest of rocks. Don’t take too much time to celebrate the steep climbs, nor stay in distress when you stumble because your perspective is narrow compared to how others view you. Oh what a glorious day. Therefore do not be distraught over my fate, rather continue your journey upward going beyond what I ever could have imagined. You will not be defined by how you start, nor by the setbacks along your journey, but how you finish. There is still time for you . . . time to end well.